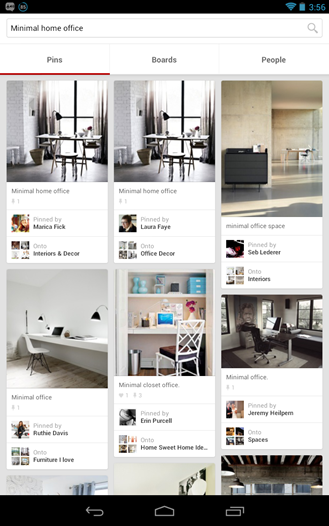 Here's how it all started: I routinely check some of my favorite office design sites - like Minimal Desks and Simple Desks (the latter of which isn't updated as often) - for new ideas on how to rearrange my home office in a more simplistic and minimal, yet practical way. 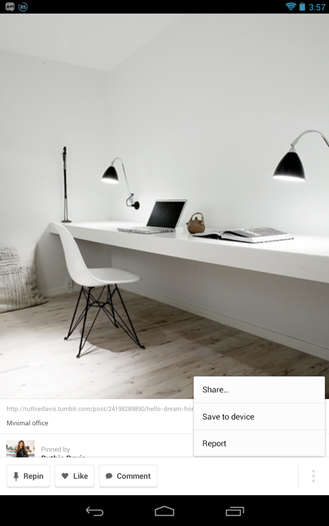 One night I decided to search Google/Images for minimal offices, industrial desks, and the like. Guess which site continuously popped up in the search results? Pinterest. It was then I realized what a powerful tool it actually is. Still, I didn't join. After much encouragement from my lovely wife, I was convinced that joining the site would help me keep my ideas and inspirations organized far better than my current system of saving my favorite images to Google Drive (note: always listen to your wife, she knows you better than anyone). That was working out really well, but there was one key thing missing: an Android app. 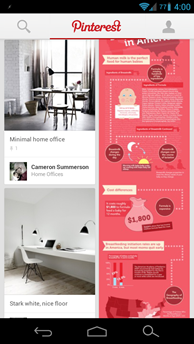 After using Pinterest for just a bit, it was very clear how well the interface would translate to mobile. 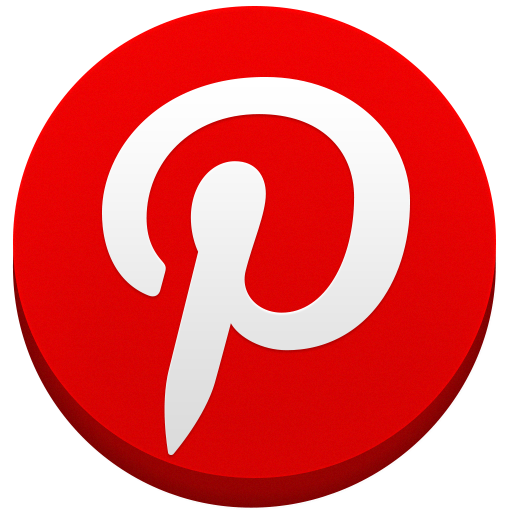 Then, last night, just seconds after I turned to my wife and said how much I want a Pinterest Android app, it happened: Pinterest landed in the Play Store. Naturally, I immediately downloaded the app. First on my Nexus 7, then my Galaxy Nexus, and lastly, the TF700 (so I could get a good idea of how it translated across various device sizes, of course). My first impression? 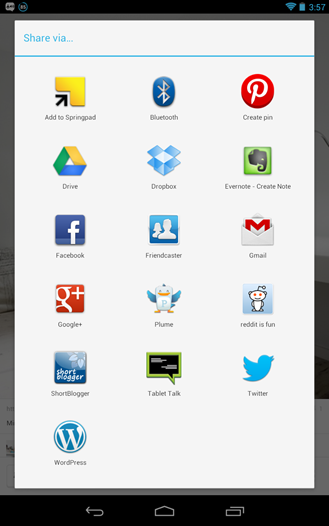 It reminded me of the Google+ app, and that's a good thing. Kind of like a crossbreed between the Pinterest site and the G+ app. 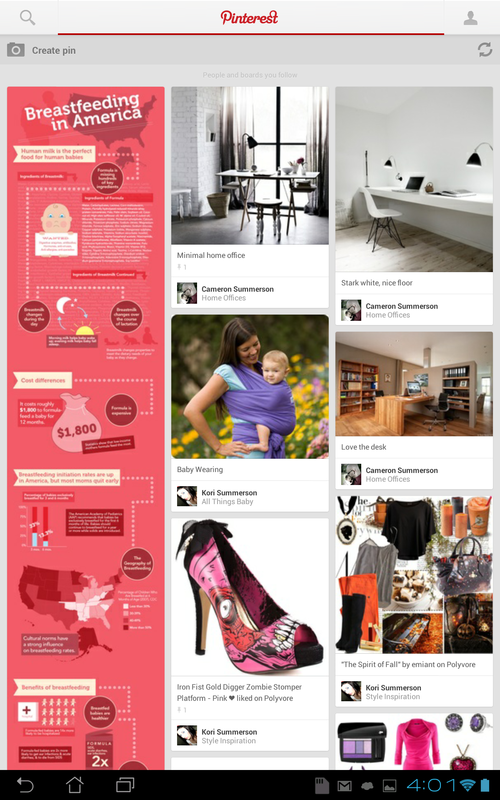 I'll just come out and say this: in many ways, the Pinterest app is better than the website. 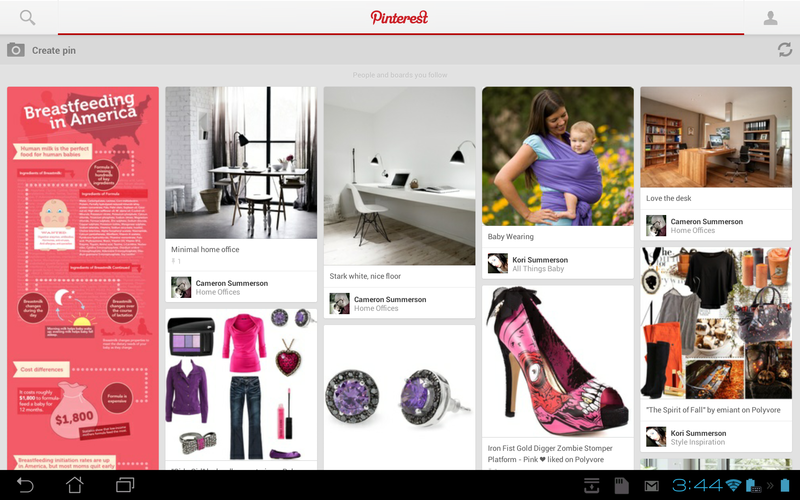 It's fast, easy to use, and is incredibly intuitive. Anyone who uses the service and has already installed the app can probably attest to that. In fact, I now prefer it to the site. It's as if the service was designed with mobile in mind right from the start. As soon as you fire the app up and sign in, you're immediately presented with the same content you would normally find on the homepage of the site. 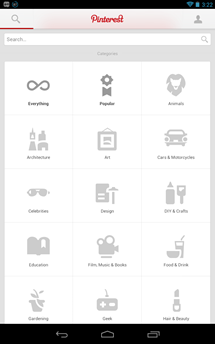 A swipe to the right goes to the categories/search page, and a swipe to the left take you to the dashboard. 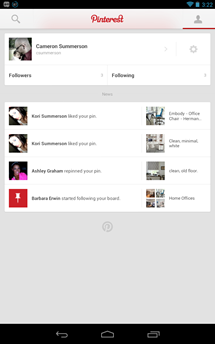 In the dashboard, you can see your "news" (read: notifications), and manage your followers. To the right of your name/username is the settings menu, which actually doesn't offer much in the way of, you know, settings (compared to its web counterpart, anyway). The real meat and potatoes of Pinterest, of course, is found within the images. 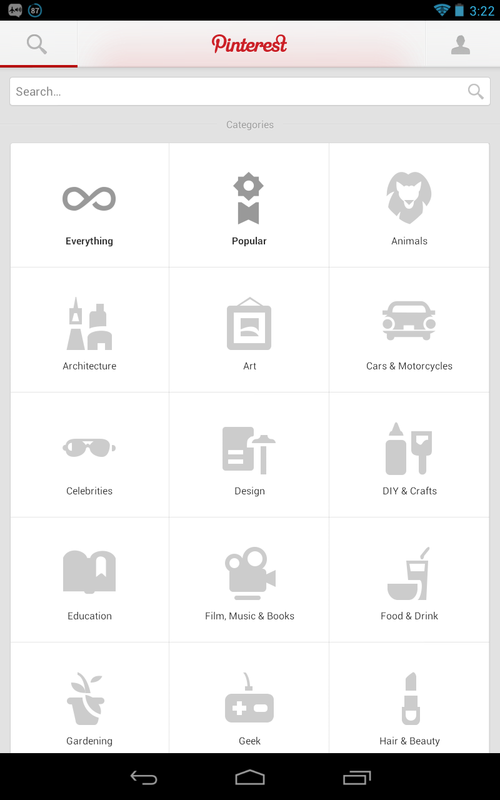 The search/categories page is just as easy to use as the site, and everyone familiar with the service should feel right at home in the app. After searching for an image, all the familiar options are there: pins, boards, and people. 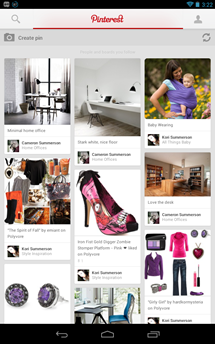 The Pinterest app makes terrific use of the Holo layout without actually using the Holo theme; that is, you can swipe back and forth between the aforementioned categories, but it keeps the same familiar white and red theme that is synonymous with the site. A simple tap on any image opens it up and displays the options to repin, like, or comment on the image down at the bottom of the screen, along with a menu button on the far right. From there, you can share the image through the normal Android share context menu, save the image locally to your device, or report the pin for a violation of the terms of service. 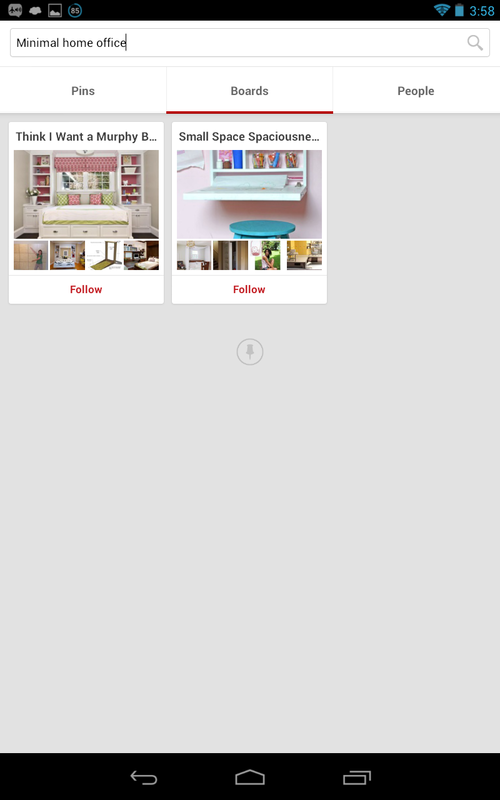 One of my favorite things about the app is that, once you've pinned an image, it takes you back to the main search screen with the list of results. By contrast, the website actually displays a popup letting you know that the image was successfully pinned, after which it goes back to the pinned image. It's all a bit superfluous to me, so I absolutely love the fact that the app doesn't do that. Both "like" and "comment" work as advertised, and since this is basic functionality found it many apps, I'm not going to go into detail there. All that's great, but how does the interface translate across various screen sizes? One word: brilliantly. 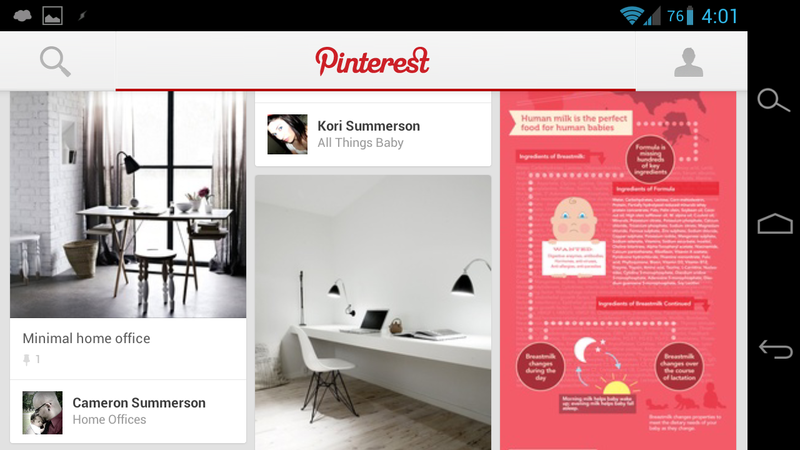 This is actually the area in which the Pinterest app reminds me of G+ the most. On my Nexus 7, for example, I'm presented with three columns of image results in portrait after a search; switch that up to landscape, and it offers four columns. On the Galaxy Nexus, it only shows two in portrait; three in landscape. And on the TF700, which has a larger 10.1" display and is used primarily in landscape mode, it displays five columns of pictures in landscape; three in portrait. Here's the point: the app is incredibly dynamic across various screen sizes and resolutions, while still keeping the same look across all. 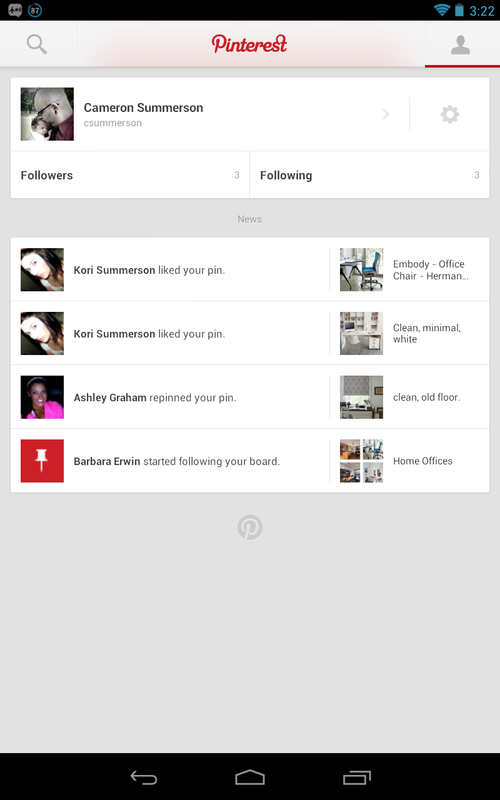 Just like the G+ app. And I love it. 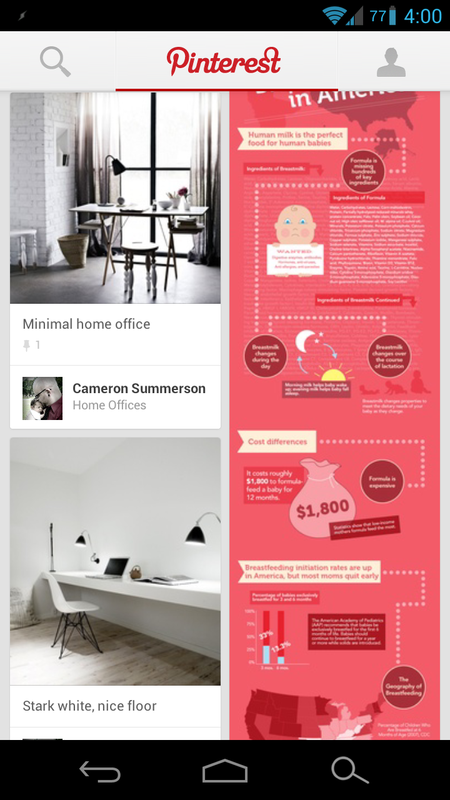 Overall, I'm incredibly impressed with the Pinterest app. 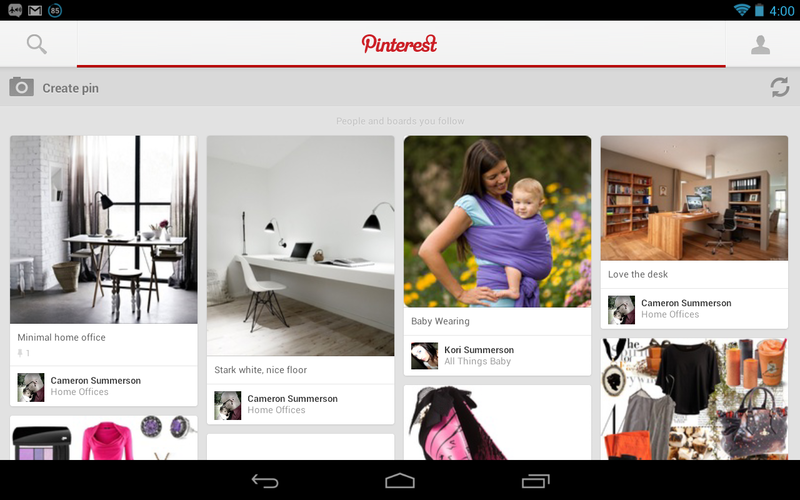 It's clear that the developers paid very close attention the Android design guidelines, but they also kept the same look and feel of the Pinterest site. They also made sure that it works well across both phones and tablets of varying resolutions and display sizes without drastically changing the interface for each. This is, hands-down, one of the cleanest, most well-designed apps that I've ever used (and I don't say that lightly); especially for the first version from a major service. A tip of the hat is in order to the software architects who created this masterpiece - you guys deserve it.